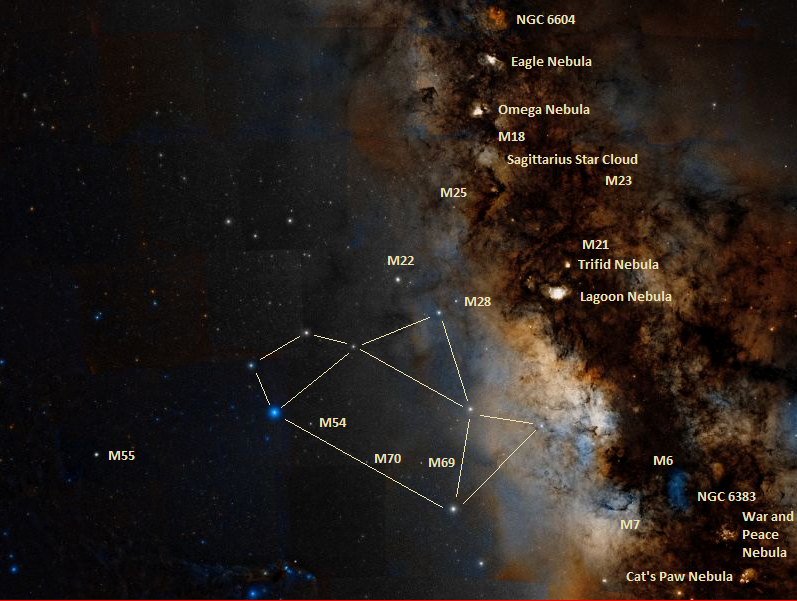 The eight bright stars – Kaus Australis (Epsilon Sagittarii), Kaus Media (Delta Sagittarii), Kaus Borealis (Lambda Sagittarii), Alnasl (Gamma Sagittarii), Ascella (Zeta Sagittarii), Nanto (Phi Sagittarii), Nunki (Sigma Sagittarii) and Hecatebolus (Tau Sagittarii) – form the shape of the celestial Teapot. 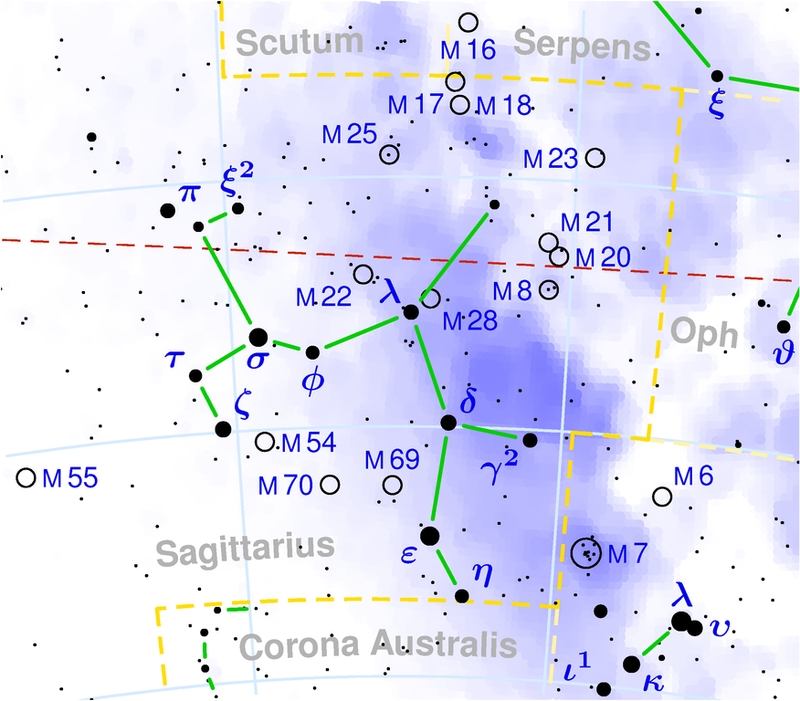 The asterism lies next to a dense area of the Milky Way and can be used to find a number of Messier objects and other famous deep sky objects. Under exceptionally good conditions, the Milky Way appears as steam coming out of the spout of the Teapot. The stars of the Teapot also mark different parts of the Sagittarius figure. Sagittarius is usually depicted as an archer drawing his bow and pointing an arrow in the direction of Antares, the red supergiant star that marks the heart of Scorpius. The star Alnasl gets its name from the Arabic word for “arrowhead,” while the stars Kaus Media, Kaus Borealis and Kaus Australis represent different parts of the bow. The stars’ names mean “centre of bow,” ”northern bow,” and “southern bow,” respectively. Unlike the Teapot, the entire star pattern of Sagittarius is difficult to make out. 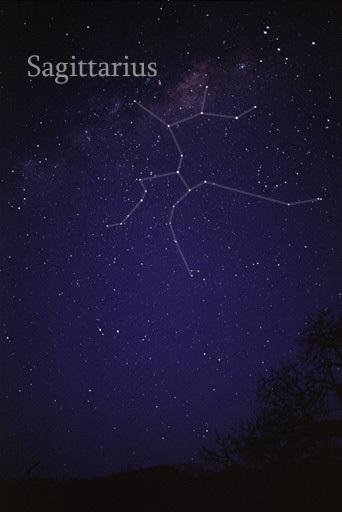 In mythology, the constellation represents a centaur – the mythical half-human, half-horse creature – holding a bow and aiming an arrow toward the celestial Scorpion. Sagittarius is sometimes also associated with the mythical Crotus, the satyr said to have invented archery. Crotus was the son of Pan and lived on Mount Helicon. In the myth, Zeus placed him in the sky at the request of the Muses. For northern observers, the best time of year to observe Sagittarius is during the summer, when the constellation reaches its highest point above the southern horizon. The body of the Teapot is formed by the stars Kaus Media (Delta Sagittarii), Kaus Australis (Epsilon Sagittarii), Ascella (Zeta Sagittarii) and Nanto (Phi Sagittarii). Kaus Borealis (Lambda Sagittarii) marks the point of the lid, Alnasl (Gamma Sagittarii) marks the tip of the spout, and Nunki (Sigma Sagittarii) and Hecatebolus (Tau Sagittarii) form the handle of the Teapot. Kaus Australis, Epsilon Sagittarii, is the brightest star in Sagittarius. It has an apparent magnitude of 1.85 and an absolute magnitude of -1.41. The star lies at a distance of 143 light years from Earth and has the spectral classification B9.5 III. Kaus Australis is a binary star system dominated by an evolved blue-white giant star with a radius about 6.8 times that of the Sun. The primary component, Epsilon Sagittarii A, is about 3.5 times more massive than the Sun and 363 times more luminous, with an effective temperature of 9,960 K. The star’s estimated age is 232 million years. Epsilon Sagittarii A is a rapid spinner, with a projected rotational velocity of 236 km/s. It is a source of X-ray and infrared emissions, indicating a presence of a circumstellar disk of dust. The companion is a main sequence star with a mass 95 percent that of the Sun, a temperature of 5,807 K, and an intrinsic luminosity 0.89 times that of the Sun. It is separated from the primary component by 2.392 arc seconds. The traditional name of Epsilon Sagittarii, Kaus Australis, is derived from the Arabic qaws, meaning “bow,” and the Latin word for “southern,” austrālis. Nunki, Sigma Sagittarii, is the second brightest star in Sagittarius, with a visual magnitude of 2.05. The star has a radius 4.5 times that of the Sun and a mass 7.8 times solar. It lies at a distance of 228 light years and has the spectral classification of B2.5 V, which means that it is a blue-white main sequence star. Its estimated age is 31.4 million years. With a surface temperature of 18,890 K, Nunki is about 3,300 times more luminous than the Sun. It is a fast rotator, with an estimated rotational velocity of 165 km/s. The star has a magnitude 9.5 line-of-sight companion at an angular separation of 5.2 arc minutes. The star’s name, Nunki, is Assyrian or Babylonian in origin. It was recovered by archaeologists and made public by R. H. Allen. The star is also known as Sadira. 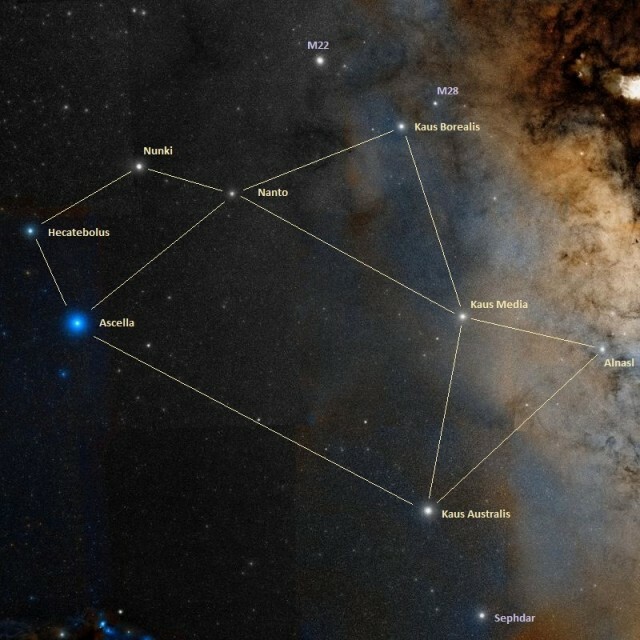 Ascella, Zeta Sagittarii, is the third brightest star in the Teapot and Sagittarius constellation. It has an apparent magnitude of 2.59 and lies at a distance of 88 light years. Zeta Sagittarii is a binary star composed of two stars that orbit each other with a period of 21 years. The system has a stellar classification of A2.5 Va and a combined mass of 5.26 solar masses. The components are an A2 giant star with a visual magnitude of 3.27 and an A4 subgiant with a magnitude of 3.48. They are separated by 13.4 astronomical units. The system has a 10th magnitude companion at an angular separation of 75 arc seconds from the primary component. Ascella is receding from us at a velocity of 22 km/s. The star system was considerably brighter about 1 to 1.4 million years ago, when it came within 7.5 light years of the solar system. Kaus Media, Delta Sagittarii, is a double star with a visual magnitude of 2.70. It has a stellar classification of K3 III and lies at a distance of 348 light years from Earth. The primary component, an orange giant, has three faint companions: a 14th magnitude star 26 arc seconds away, a 15th magnitude star 40 arc seconds away, and a 13th magnitude star at an angular separation of 58 arc seconds from the primary. It is unclear whether these stars are physically related or merely line-of-sight companion. Kaus Media marks the middle portion of the Archer’s bow. Kaus Borealis, Lambda Sagittarii, marks the top of the bow. It has a visual magnitude of 2.82 and lies at a distance of 78.2 light years from Earth. The star has the spectral classification of K0 IV, which means that it is an orange subgiant, and an effective temperature of 4,770 K. It has a mass 2.6 times that of the Sun and is about 11 times larger. Alnasl, Gamma Sagittarii, marks the tip of the Archer’s arrow. It has an apparent magnitude of 2.98 and lies at a distance of 96.9 light years from Earth. It is the seventh brightest star in Sagittarius. Alnasl is an orange giant with the stellar classification K1 III. It is 12 times larger than the Sun and has a surface temperature of 4,760 K, slightly lower than our star (5,778 K). Alnasl has a magnitude 4.7 optical companion at an angular separation of 50 arc minutes. The companion, W Sagittarii, is a Cepheid variable. Gamma Sagittarii is also known as Nasl (El Nasl), Warida and Nushaba (Nash). The name Alnasl is derived from the Arabic al-naşl, meaning “arrowhead.” Nushaba has the same meaning. Nanto, Phi Sagittarii, is the ninth brightest star in Sagittarius and easy to spot without binoculars. It has an apparent magnitude of 3.17 and lies at an approximate distance of 239 light years from Earth. Its spectral type is B8.5 III to B7 IV, which means that it is a blue-white star either in the giant (III) or subgiant (IV) stage of evolution. Nanto has an effective temperature of 14,990 K and is 475 times more luminous than the Sun. It is 4.8 times larger and about 4 times more massive than our star. Hecatebolus, Tau Sagittarii, is an orange giant with the spectral classification K1 III. It has a visual magnitude of 3.326 and lies at a distance of 122 light years from Earth. The star has a radius 16 times that of the Sun and a mass of 1.5 to 2 solar masses. It has a surface temperature of 4,860 K.
Tau Sagittarii is a suspected binary star, but the presence of a companion has not been confirmed yet. The star has an unusually high velocity relative to the Sun, 64 km/s, which is four times the local average. The star’s peculiar velocity and lower metal content indicate that it came from a different part of the Milky Way. Hecatebolus is the closest visible star to the origin of the Wow! signal, a strong narrowband radio signal received on August 15, 1977. The Wow! signal was the only possible sign of extraterrestrial intelligence ever discovered. It appeared to have come from an area of the sky without any stars or planets, just to the northwest of the globular cluster M55, the Summer Rose Star. 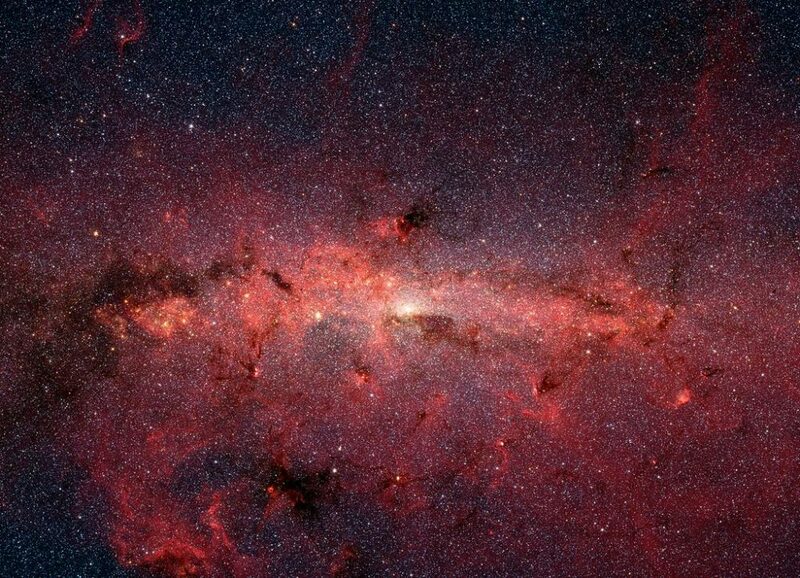 The galactic centre lies in the direction of Sagittarius and the Milky Way is at its densest in this region of the sky. The galactic centre, the rotational centre of the Milky Way, lies at an approximate distance of 25,000 to 28,000 light years from Earth. The position of Sagittarius A, a complex astronomical radio source, was adopted as the true zero coordinate point of the Milky Way centre by the International Astronomical Union in 1958. One of the components of Sagittarius A, known as Sagittarius A*, is believed to be associated with the Milky Way’s central supermassive black hole. The galactic centre can’t be observed with regular telescopes because clouds of dust and gas block our view of the Milky Way’s core. The region can only be studied in X-ray and radio wavelengths.